Something both surprising and a little worrisome has happened to one of my favorite trees. A crack about 6 feet long and as wide as my pinky finger in some spots has opened up along the trunk of the oak that sits on the north side of our house. As far as I can tell, the crack opened up over the weekend, likely the result of the fluctuations in temperatures over the past couple of weeks. Most Minnesotans would say it’s been just plain cold this entire month, but local weather sources here have recorded temperatures as low as 32 below zero F and as high as 32 above zero F over the past 10 days. 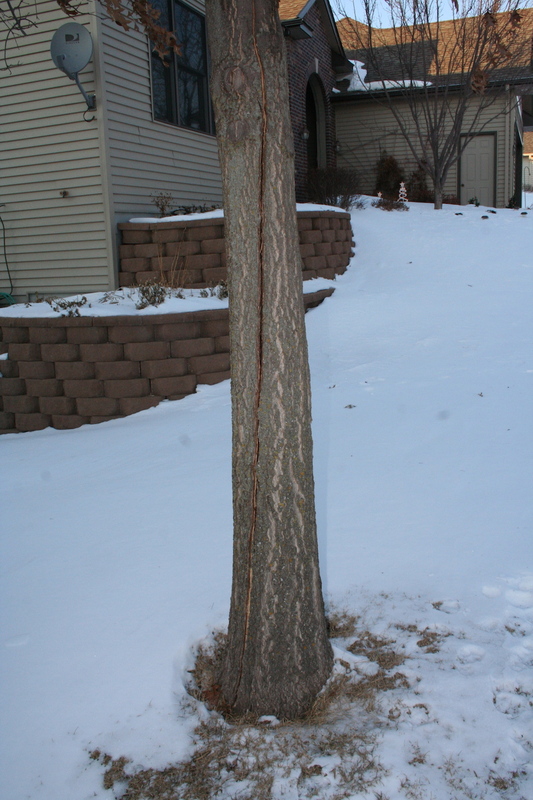 I checked the University of Minnesota extension web site, which indicates that these cracks are not uncommon during severe cold. With luck, the tree will heal itself over the summer and survive with only a large scar to show for the experience. Without luck, the crack could be the entry point for insects or disease. Here’s hoping. We have a Peppermint tree (agonis flexuosa) that has done the same thing. It started 5 years ago – or more – and has continued ever since. However, the tree doesn’t seem affected by it at all and hasn’t died, stopped growing or even threatened to fall over. Obviously a very strong root system. I hope yours continues to remain healthy. Hopefully it is just a growth thing and will scar over with no ill effects. Look out for running sap and bugs. Good luck. The repeated freeze/thaw cycle is so hard on trees. It is always disappointing to lose a beautiful mature specimen. With luck, your tree will heal and survive. When I lived in Calgary, we used to get Chinooks (a rapid warming) in the middle of extreme cold weather. The alternating warming and deep freezing played havoc with the trees.